Every year, millions of people are exposed to bacteria and contaminants that can be harmful to them. Many of us do not even realize that we come in contact with them because we don’t realize that they are floating around in the air that we breathe. People with allergies tend to have a better understanding of this scenario because they have to watch out for what they breathe in if they’re allergic to something. 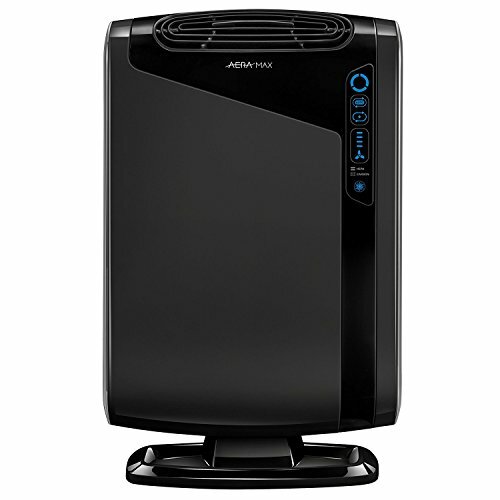 An excellent way to help with allergies is to invest in the best air purifier for allergies. Keep reading, and we’ll help you select one from the top 5. 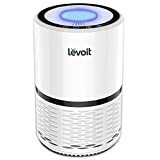 The Levoit LV-H132 Air Purifier was created as a product to trap allergens, dust, mold, and other particles while also destroying odor-causing bacteria in the air. It was designed to be used during springtime and help with allergy season. It can get rid of common allergy triggers that are lurking in your home. This includes pollen, mold, dust mites, pet dander, and other pollutants. 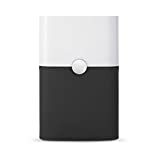 It’s designed to look modern and sleek, and comes with the option of being able to use it as a night light; this makes it perfect for a child’s bedroom or for people who don't mind LED lights during the night. 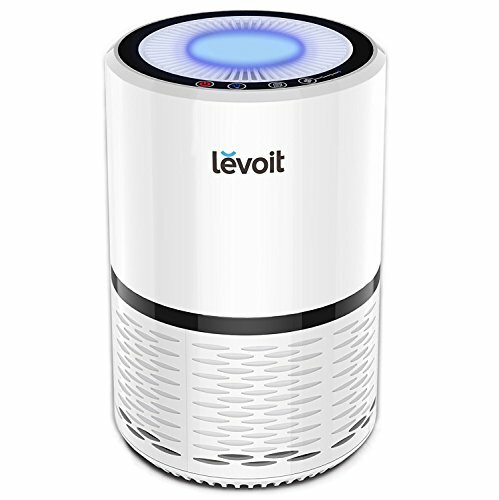 The Levoit LV-H132 Air Purifier has a built-in 3 stage filtration system. It consists of an activated carbon filter, a pre-filter, and also a true HEPA filter. These filters work together to gather and trap 99% of odors, debris, smoke, pollen, mold, and sanders. It can filter particles which are 0.3 microns or larger and can filter air pollutions of up to 2.5 ppm. It’s designed to be 100% ozone free, as UV rays and ozone filters can emit harmful pollutants that can lead to serious health problems in the future. The device has three separate speed settings: high, medium, and low. For smooth operation, you can adjust the speeds, and each mode will operate quietly at all times. Included in the night light setting are two different brightness options. 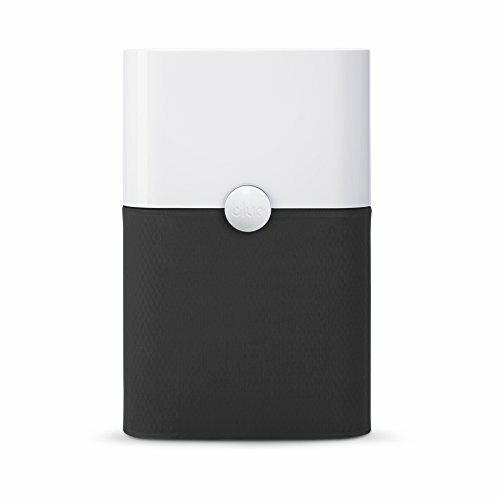 The design and build of this air purifier are compact and easy to transport. It can fit perfectly into smaller rooms such as bedrooms, offices, and other places. If you aren’t delighted with the way you're purifier is operating you can contact their support team as you get a free 2-year warranty along with lifetime support. The Blueair Pure 211+ Air Purifier is designed to help get your air quality cleaner than ever. It’s designed with an enhanced filtration system that helps ensure that there are no air pollutants lurking inside your home. It can support larger rooms and has a high CADR rate. It uses less energy than other models, and is environment friendly. You can save money while also producing fresh air into your home. It only uses 60 watts on the highest setting and is up to 60% more energy efficient than other purifiers on the market. Lastly, it’s designed to run super quietly, thus allowing it to be placed in areas you or your family frequent. The Blueair Pure 211+ Air Purifier uses a true HEPA filter which can capture up to 99% of airborne pollutants. This includes dust, mold, allergies, pet dander, pollen, and smoke. It also uses an activated carbon filter which can help remove any odors caused by cooking, pets, and smoking. 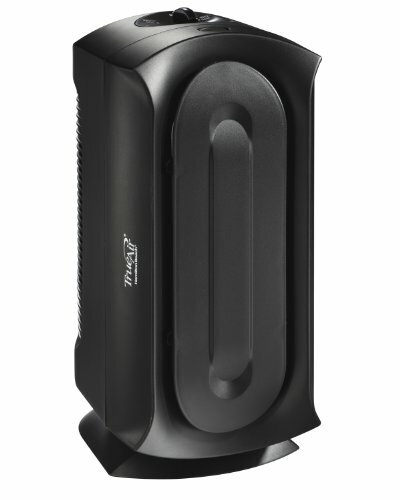 It’s one of the top-rated air purifiers that have a low sound output. It’s also environment friendly because of its low energy use. It’s ozone free because ozone and UV rays can be harmful to humans if you come in contact with them frequently. It’s suggested to use in rooms 400-600 square feet for optimal performance. 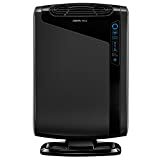 The Fellowes AeraMax 200 Air Purifier is designed to help remove airborne particles which may be harmful to humans or any other living creatures. It’s specifically designed to help manage allergies, colds, and flu. 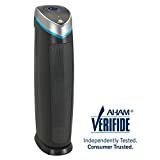 If you have Asthma, then this air purifier also has been approved by the Asthma & Allergy Friendly Organization (AAFA). Never again will you have to worry about pollens or allergens sneaking around and sticking to your clothes or your inside environment. The Fellowes AeraMax 200 Air Purifier has been proven to be very effective at trapping and eliminating the influenza virus from indoor living areas. 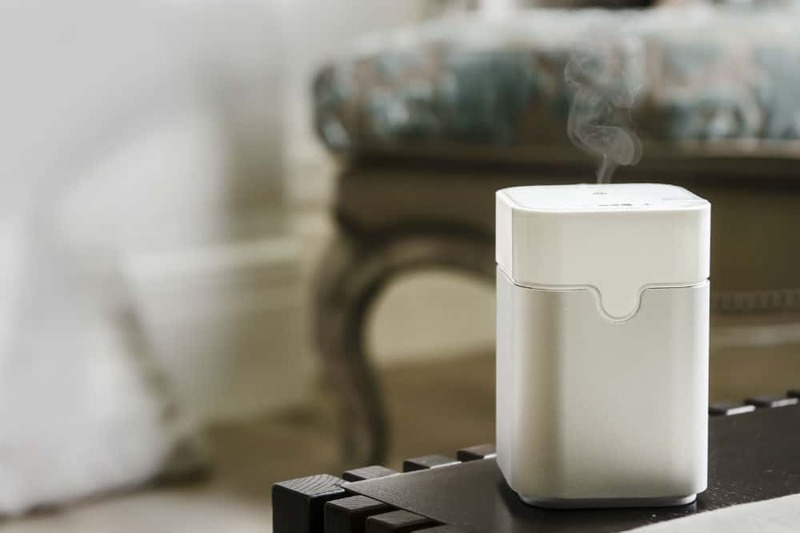 It comes equipped with an Area Smart Sensor which can help monitor the air quality in your home. The light with flash blue when the room is considered “safe and clean” and flash red when it “needs cleaning.” This can help you determine when you need to have the device on and off. It uses a four-stage filtration system which includes a true HEPA filter with AeraSafe antimicrobial treatment. With this combination, it can collect up to 99% of airborne molecules. These particles can be as small as 0.3 microns and include ragweed, allergens, viruses, pollen, dust mites, germs, mold, and smoke. It’s recommended for rooms 300-600 square feet and has an indicator installed on it for when the filter needs changing. The GermGuardian AC5250PT Air Purifier is more than just a regular old air purifier. It has multiple levels of filtration systems which include different ways to ensure that all harmful and odor-causing bacteria and contaminants are being picked up and trapped. It uses true HEPA filtration which can help get rid of household allergens and also is used to help asthma patients. It’s doctor recommended and is energy efficient, ensuring that you don’t have to spend a lot of money to keep it running. 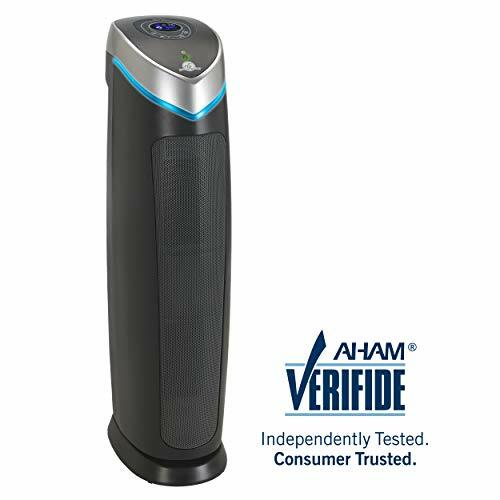 The GermGuardian AC5250PT Air Purifier uses true HEPA filtration as a means to get rid of 99% of germs and other harmful contaminants including mold spores, pet dander, and dust mites,. Included is an activated charcoal filter which helps trap larger and odor-causing bacteria. Lastly, it uses a UV-C filter which can help trap and destroy any harmful chemicals or bacteria that are lurking inside your rooms. This filtration system is great for people who have allergies or pets. The CADR is rated at 125+. The system comes with a filter change indicator and can run up to 8 hours at a time. It has 5 speed settings and an ultra-quiet mode for when you sleep. The Hamilton Beach True Air Purifier can help save you money and time with its permanent HEPA filter. The filter is permanent and will never need replacement. You can reuse it as many times as you like, making it eco-friendly. It has high performance and can help reduce harmful particles that attach to air molecules. It’s recommended for large rooms and can be used either horizontally or vertically. It’s compact which makes it easy to stow away in a corner, ensuring that it’s always in use but never taking up needed space. The Hamilton Beach True Air Purifier uses a permanent HEPA filter which can be reused by being vacuumed. It has a high-performance filter which can capture even the smallest of particles. This includes dust, mold, bacteria, viruses, and many other harmful contaminants. It’s recommended to be used in rooms of up to 160 square feet and can be used horizontally or vertically. It includes an ultra-quiet motor and fan; this way you’ll hardly notice when it’s on. You have 3 speed settings: high, medium, low. As you can see, air purifiers can be very handy when it comes to getting better quality air in your home. You can eliminate any harmful particles and reduce the number of harmful bacteria that are lurking in your home. If we had to recommend the best air purifier for allergies, it would have to be the Blueair Pure 211+ Air Purifier. This is because it works in larger rooms, making it perfect for families. It has a HEPA filter and avoids using ozone technology which may be harmful to your health. Hopefully, this guide has helped you choose an air purifier for you and your family. Just remember that you need to purchase replacement filters every 6 months.